- You can use this asset for personal and commercial purpose. Credit is not required but would be appreciated. - Modify to suit your needs. Yo this is so cool. You know what you should do. Make a pack with a test environment and enemies to go with this and sell it. I would buy it for $50. I'm a programmer and I find it hard to find prototyping assets. Anyway that's up to you of course but I really like this. Hello, I am very interested in your character. I have a question, if I make a video game with it and put the credits with your name in the game. Can I sell the game I create? Hello, Very Goog Evening, how're you? My Congratiolaction for your work, very beautifull, can I use this Sprite wuith your name with credits in my game and can I do modifications? Thank You Very Much For Your Help!!! Hug!!! Yes, you can use it and modify it. Thanks so much!!! Super fun little character that made my game look way better! May I change some of the character's elements, like pallette color and a few other details (like removing the sword from his back)? Also, do you accept comissions of more sprites of this specific character? 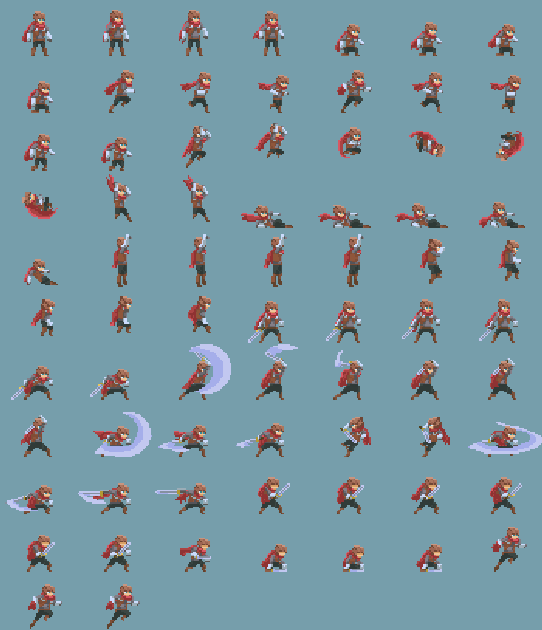 I'm starting a project, and would like to use him as a possible protagonist, but in the future I might need more sprites in this style (like NPCs and/or enemies), and I would like to know your commission availability before starting to use it. Yes, you can modify the sprites. I'm currently not available for commission work. Under which licence are your asset? PS: Sorry for my English. I know this are not good. You are free to use the assets personally and commercially. You can also modify them. The only restriction is redistributing the assets as another graphical asset. Hi! I really like your assets and I was wondering what you're planning to do next. Cool color palette! Looks really good! Thanks… You make this very good. I love these set. Fantastic work! I've really appreciated how quickly and easily I've been able to get a good looking game prototype up and running using a collection of your assets despite having no artistic skill of my own. This character in particular is exceptionally well done and the number of animations is phenomenal. If you're still working on him, suggest considering a crouch attack, that's really the only animation I've found that's missing. Thanks for your great work. Can I use those assets in an open source game engine's demo with your credits? This game engine is brand new and will be published soon. The concern is, since people will have access to the project files, they will get direct access to the resources as well. And since it is indicated that redistribution is not allowed, is that a no as well? If it is with the demo project files, yes you can. Thanks alot for sharing this!, i will make sure to credit you. I used your work in my music video! Your work is really great, I wish I had more time to use more of the actions! But anyway, I enjoyed using your art. Never thought I could find something amazing here for free! Thanks! Hey rvros, Thank's for your art, the character and animations is perfect! I made a html5 and android game with your asset and put your name on credits inside the game. I hope you and other guys enjoy it! Your art appeared in a video of unity, is called: Unity 2018.3: New Features and Improvements. In 2:13 minutes!!! Hi, I love your work! Do you want to help me create a game? Hi, I really love your work and am planing to use them in one of my demo project. One question though... What is the dpi/ppi for the sprites? Hello, I'm not sure if dpi/ppi is applicable for pixel art but this sprite is 50x37 px. You can just scale the sprite with your preferred dpi/ppi with point filter or Nearest Neighbor (hard edges). Hope that helps, thanks! Could you make a color palette that matches the character, please? You can access the color palette in the original files.zip. It contains the .aseprite so you can change the palette easily. Awesome work! More than enough animations to play around with/prototype. WOW.Thank you and Can I use this character in my game? Hey quick question, I wanted to make a game on construct 3 and needed a sprite... was wondering if I could use this sprite? I would really appreciate it if you you would be OK if I were to publish a game with this sprite as the main character, If not that is totally fine. Hello, I started working with games recently and I wonder if I can use this sprite for my game, with clear credits of course. Q: A simple game, but I plan to put it in the playstore. Your work is unparalleled. Ive looked through all of the pixel art on multiple different websites, both free and premium, and none have even come close to being as indepth and well-drawn as yours. 39 animations, are you kidding me? The character style doesn't quite fit the gothic pixel 2d rpg that I'm making, but your sprites are so well done that I am going out of my way to make it work. 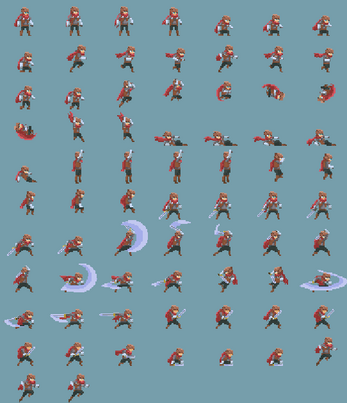 It has actually been a joy putting together the animations and hitboxes from your tilesets. Hi there, im new in game developing and i saw this superb adventurer you created, can i use it? if we manage to publish our game in playstore in the future we'll let you know and we will put you in the credits, thanks!! Hi, Rvros. Great work with this animation. Can I use that on a game that I am developing for Android? I will give you the credits..
Hi there, I work for Unity and we are interested in using your assets for a demo. Would you be willing to discuss this with me? If so, we can figure out how to exchange email addresses. Thanks! Hello, you can contact me on this email address: rvrosinfo@gmail.com. Thanks! Hi rvros, nice work you going on here, but i would like to ask you if you could help me setting up some of the animations. At least see if you could say the animations frame rate. And would be really cool if you could help me making a Texture Atlas for the animations.